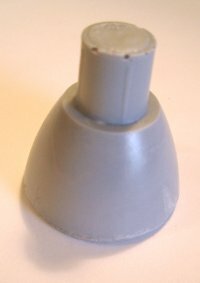 This Replica part is cast in gray Urethane Plastic and will accept enamel or acrylic paint with the appropriate primer. 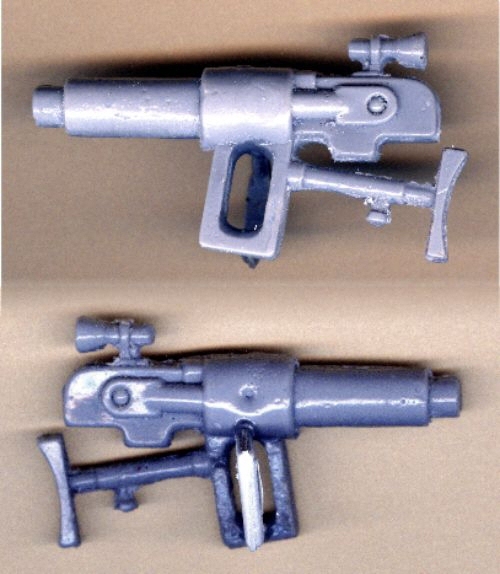 Only one laser rifle was supplied with each Eagle 1 playset and it was designed to be stored on the Weapons Rack or allow an astronaut figure's hand to slide through the plastic 'strap' for increased play value. Due to its small size, this piece, (like the elusive Stun Gun), is one of the hardest Eagle 1 accessories to find. Don't leave Commander Koenig defenseless against marauding aliens in rubber suits - Arm Moonbase Alpha's leader today! 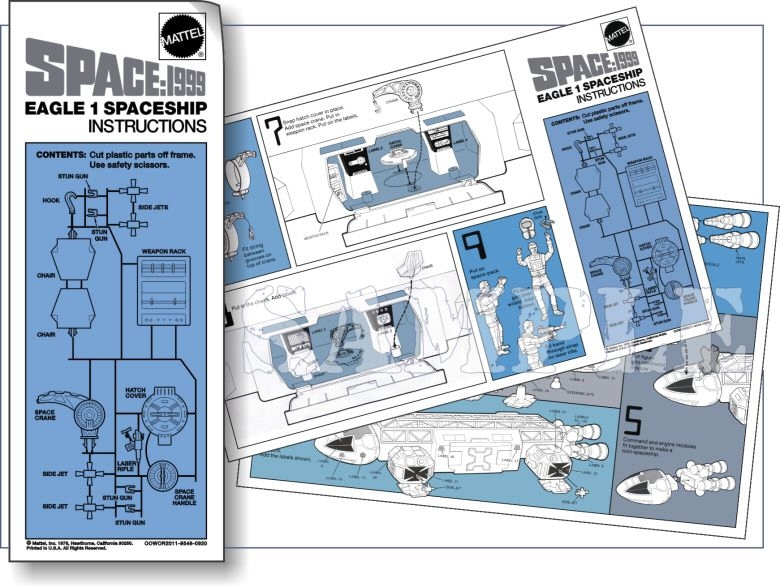 A massive, colour reproduction of the Mattel Eagle 1 Instruction Sheet measuring 19 x 12" and printed on both sides. An original sheet was meticulously scanned, 1 panel at a time and digitally retouched to eliminate any flaws such as discolouration, stains and tears. The clean panels were then recomposed and output on 19 x 12" stock which was then folded to create a 4.75 x 12" document as per the original. An essential item to complete your Eagle playset and excellent reference for parts, placement and assembly. Even a scientific genius like Professor Bergman would be lost without a set of instructions. Available now. 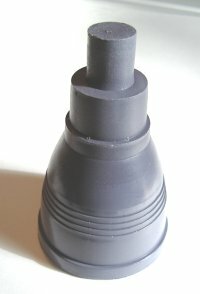 Cast in Gray Resin with drilled hole to accommodate the black thread. Color approximates the original. 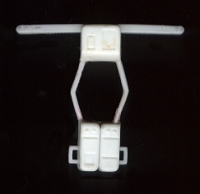 Cast in white urethane with an interior wire armature inside thecasting to support the thin shoulder & waist straps. A very difficult piece to cast. May need some minor touch up with white paint. 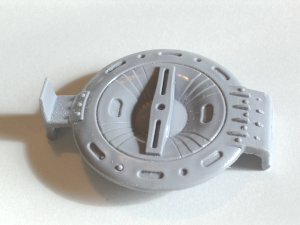 COMMLOCK for 9" Mattel Space 1999 figures. Gray resin. Color approximates the original. Clips onto the character's belt as per the original. 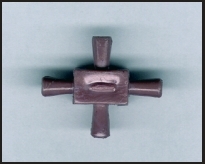 4-Way THRUSTER for the Mattel Space 1999 Eagle 1 Spaceship. Gray resin. Color approximates the original. Inserts into side pods. Requires a small dab of glue to attach securely. Vertical THRUSTER (for the Mattel Space 1999 Eagle 1 Spaceship). Cast in Gray resin. Color approximates the original. This is the small, bell-shaped engine thruster that inserts underneath the passenger pod. (The Eagle requires a set of 4 to complete it to it's original, boxed release). Can be painted for a closer color match, make sure the replica is washed in dish-detergent beforehand to remove slippery, silicone mold-release coating. Large Main Engine THRUSTER (for the Mattel, Space 1999 Eagle 1 Spaceship). Cast in Gray resin. Color approximates the original. This is the large, bell-shaped engine thruster that inserts at the rear of the spaceship. (The Eagle requires a set of 4 to complete it to it's original, boxed release). A difficult piece to cast due to its size and shape but our replica captures every detail. Can be painted for a closer color match, make sure the replica is washed in dish-detergent beforehand to remove silicone mold-release coating. 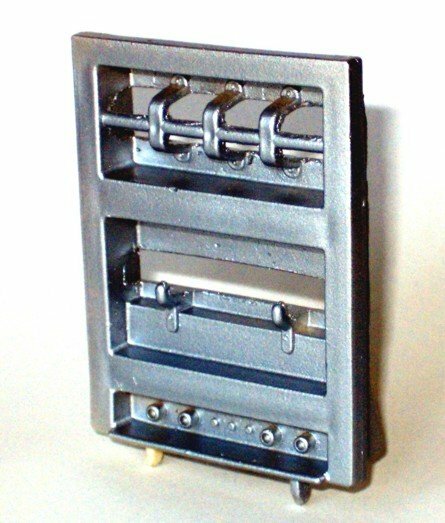 Lower HATCH DOOR (for the Mattel Space 1999 Eagle 1 Spaceship). Cast in Gray resin. Color approximates the original. This is the small, circular Hatch that inserts on the floor of the passenger pod. Can be painted for a closer color match- make sure the replica is washed in dish-detergent beforehand to remove slippery, silicone mold-release coating. Command Module - UPPER HATCH (for the Mattel Space 1999 Eagle 1 Spaceship). This is the contoured Hatch that sits on top of the Command Module. 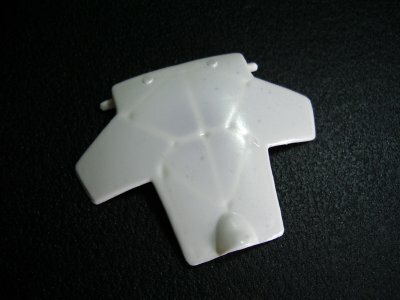 The originals were made of 'smoke' colored, semi-transparent styrene - probably a futile attempt by Mattel to allow extra light into the Module. To facilitate the casting process, ours are cast in white which actually looks more authentic when compared to the TV spaceship. WEAPON RACK (for the Mattel Space 1999 Eagle 1 Spaceship). Cast in resin & airbrush-painted metallic silver. Color approximates the original. A very difficult piece to mold & cast due to fine detailing & some wicked undercuts. We chose to produce these replicas as painted items to disguise minor retouching of each weapon rack. Be assured that the racks display perfectly and Cmdr. Koenig can now hang up his loose Stun Gun.